Indeed the fragmentary, incomprehensive and reticent nature of Kiaer's visual language forms the meat and potatoes of his practice. This is part of the work's sickness, but it is also what gives it life. It is pervaded by an ever-present promise of something withheld, of something mysterious, vast and wonderful yet now obscured and forgotten. 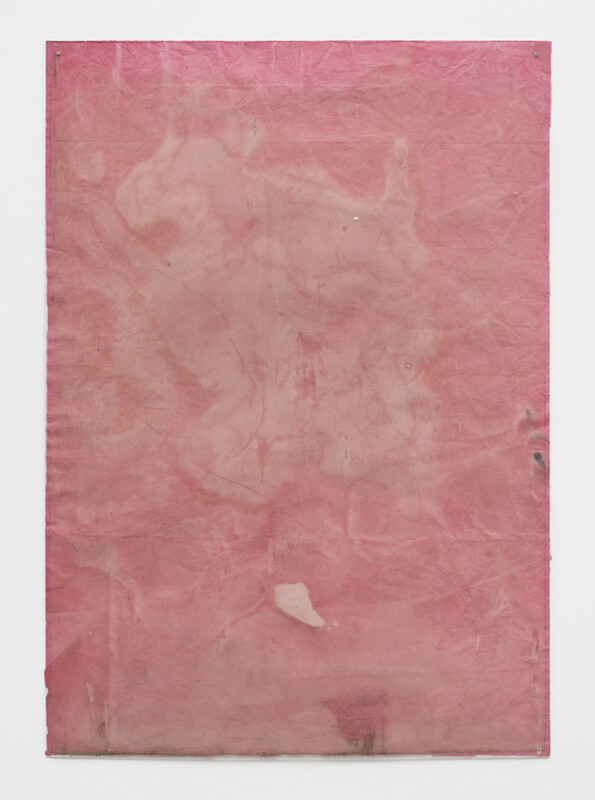 Alison Jacques Gallery is pleased to present Endnote, ping, the first solo show of new work by British artist Ian Kiaer since his solo exhibition Endnote, tooth at the Musée d'Art Moderne de la Ville de Paris (2017-2018). For two decades, Kiaer has worked with found materials to produce paintings, sculptures and installations that rest between chance and intentionality. The title of the show refers to Samuel Beckett's short story Ping (1966) that alludes to an embodied space where repeated words defy a linear reading in favour of something more spatial, material and rhythmic. Kiaer's new series of multi-layered paintings comprise of Plexiglas from discarded bus shelters laid over delicate watercolours. The new mark making coexists with marks and traces already on the plexi, allowing images and text to emerge and encapsulate time. The works in the exhibition are the product of three avenues of enquiry: Samuel Beckett; philosopher Michael Marder's thinking on plants, and Californian 1970s architecture in particular the experimental and temporary structures of Peter de Bretteville. Emphasising qualities of lightness, impermanence and transparency, Kiaer's new work continues to build on earlier projects inspired by utopian architectural thought and lifts fragments into different relations and allows us to see their new propositions. Ian Kiaer (b. London, 1971) lives and works in London and Oxford and has collaborated with Alison Jacques since 2001. Museum solo exhibitions include Endnote, tooth, curated by Fabrice Hergott and Odile Burluraux, Musée d'Art Moderne de la Ville de Paris, Paris (2017-2018); Endnote, Ledoux, curated by Jacob Proctor, Neubauer Collegium, Chicago (2016); Limp Oak, curated by Chris Sharp, Lulu, Mexico City (2015); Tooth House, curated by Lisa Le Feuvre, Henry Moore Institute, Leeds (2014); Centre International de l'art et du Paysage, Vassivière, curated by Marianne Lanavère (2013); Kunstverein Munich, curated by Bart van der Heide (2010) and GAM, Turin, curated by Elena Volpato (2009). In 2018, Ian Kiaer was awarded the prestigious Philip Leverhulme Prize to develop a body of research and artwork centred on the brutalist panoramic restaurant of Monsanto in Lisbon. Kiaer will have a solo exhibition at Kunsthalle Lingen, Germany, 21 September - 15 December 2019. Kiaer's work has been acquired by major museums including: Centre Georges Pompidou, Paris; Galleria Civica d'Arte Moderna e Contemporanea, Turin; Hammer Museum, Los Angeles; Museum fur Moderne Kunst, Frankfurt; Musée d'Art Moderne de la Ville de Paris, Paris; Pinakothek der Moderne, Munich; and Tate, London. EVENT: UK book launch of Endnote, tooth, published by the Musée d'Art Moderne de la Ville de Paris, with the artist present. Please click here for further details.